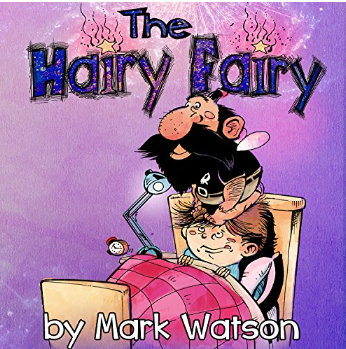 On Saturday morning, Jack wakes up to discover a hairy fairy sitting on his head. Jack is incredulous. The fairy informs Jack that his boss is angry with him for messing with her cat, so she banished him to spend a day sitting on someone’s head. He tells Jack that no one else can see him, but that doesn’t mean they can’t cause mischief and have some fun. Poor Jack is determined to carry out his previous plan to spend the day at the Scout Jamboree. When he goes to the market, the fairy causes the vegetables to grow. They soon take over the town and cause all manner of havoc. Now Jack and his nemesis are trapped. Will they be able to escape? What will happen to the town now involved with the military in a battle against the vegetables, likened to World War III? This book of fewer than fifty pages might best be described as a beginning chapter book. The clever rhymes are filled with humor and challenging vocabulary. Illustrations are done in graphic novel style. Aimed at a six to twelve age audience, I think that advanced beginning readers and middle school students will love the quirky plot and offbeat humorous rhymes. Fans of fantasy, sci-fi, and humor probably will enjoy it. I quite like the idea of having a fairy for the day! The plot is really clever and fun. This looks kind of cute! Thanks for sharing this at Booknificent Thursday on Mommynificent.com!